Kicked off my fourth summer in our group’s rented shore house in Avalon, N.J., over the Memorial Day weekend. Shortly after my arrival late Friday night, we were surprised to learn that the Princeton — a gigantic dive of a bar that I don’t like to begin with — had raised its cover charge from $5 to $7 for people who arrive after 11 p.m. As if I have enough reasons to avoid that overpriced fire hazard, now I have one more. I always expect to see some turnover among the local businesses from year to year, but I was astonished by the number of changes that had taken place since last September. Hands, a local five-and-dime that had served the town for many years, had been razed; the nearby Manhattan Bagel had been replaced by a realtor’s office; and Ocean Drive Seafood, one of our favorite take-out places, was also closed for good. Before long, I began to feel as though I were walking through Pottersville from It’s a Wonderful Life. A few of my housemates then told me that Springer’s, a family-run ice cream parlor in neighboring Stone Harbor since the 1920s, had been replaced by a Cold Stone Creamery. Having gone to Springer’s since I was a kid, I was furious to hear about its departure more than any other local establishment. But before long, my friends caved and let me in on their little joke — although a Cold Stone shop will be opening soon in Stone Harbor, Springer’s was still alive and well. The weekend was unusual in other ways, too. Of the 14 people in our shore house, only seven spent the holiday weekend at the shore — it was nice to have plenty of beds and parking spaces, but the house felt strangely quiet. And for the first time in years, I managed to select the right route at the right departure time on Monday and completed the trip home in well under two hours, which is nearly impossible on any holiday weekend. Best of all, although many previous Memorial Day weekends have been plagued by chilly, rain-soaked weather, we enjoyed bright sunshine and clear skies for most of the weekend this year. Now that’s a change I can live with. As one of very few people who has managed to evade the frightening cult phenomenon of American Idol, I must ask the rest of you to stop assuming that everyone else shares your enthusiasm for the show. If you attempt to make small talk with me by asking for my thoughts about the newly crowned Idol winner, I will be forced to politely and quickly change the subject. I’m not trying to be difficult, really. But I know as much about your beloved talent show as I do about nuclear physics: absolutely nothing. However, if you’d like to discuss the merits of the 24 season finale that aired this past Monday, you have my undivided attention. I’ve never been a big fan of Donald Trump, but after my sister passed along an interesting article about him earlier today, I think his stock is going up. As of now, there are plans to erect a new Freedom Tower on the site of the former World Trade Center in New York. The progress of the new building has been slow — although its cornerstone was laid on July 4, 2004, the Freedom Tower’s construction plans were significantly revised just two weeks ago. I’m no architecture expert, but the proposed design of the Freedom Tower has never spoken to me. The skyscraper’s crystal-like appearance and gaudy spire just seem out of place among its surroundings (although its symbolic height of 1,776 feet is a nice touch). 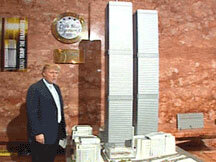 Donald Trump happens to agree with my amateur assessment, saying that the vision for the Freedom Tower is “not appropriate.” At a press conference earlier today, Trump announced his own proposal for the site — rebuild the Twin Towers with one small difference: each building would stand 111 stories tall, one story higher than the original WTC towers. Although many others have called for the rebuilding of the World Trade Center, Trump is the first person with some clout to promote the issue. And his proposal feels very appropriate — to me, the rebuilt Twin Towers would simultaneously honor those who perished on 9/11 and restore the New York skyline to its previous glory. The whole concept seems to have more heart than any new design I’ve seen. But that’s just my take on it. What do you think? Through 40 games, the 2005 Phillies have performed at a level that is quite consistent with their last few seasons: lots of expectations and few results. The Phillies currently occupy the basement of the National League East. In fact, with a record of 18–22, they’re the only NL East team that’s under .500, despite their sky-high $95.3 million payroll — the fourth highest of all 30 MLB teams. Easier said than done, Chuck. In case you hadn’t heard, Philadelphia sports fans have become quite familiar with disappointment over the last 22 years, and the current Phillies campaign isn’t giving the locals much reason for hope. Yes, indeed. If the Phillies find a way to consistently beat “the man” (the Braves and Marlins, that is) over the remainder of the season, they could win their first pennant in a dozen years. But I’m not holding my breath. The flights. Desperate for a change of pace from US Airways, I decided to book a round-trip flight on Southwest instead. The outbound flight was slightly delayed, and their method of seating people in three “zones” instead of assigned seats was a little unusual. But the overall experience was very pleasant — the planes featured comfortable leather seats even in coach class, and the flight attendants were much more friendly and attentive than I’m accustomed to. The resorts. We stayed at the Aladdin, which is located right on Las Vegas Boulevard (“the Strip”) and central to most of the main attractions. Our room was quite nice, considering the reasonable price that we’d paid for it, and Brian observed that the bathroom was larger than his entire apartment in Manhattan. We spent the better part of two days walking through the other resorts along the Strip. Highlights included the massive Venetian, which includes a shopping mall with singing gondoliers on a “Grand Canal” waterway; the Wynn, which opened its doors just a week before we arrived and required $2.7 billion to build; and the Luxor, a giant pyramid-shaped hotel with diagonal elevators. Most of the major hotels in Vegas were architectural marvels — they would put the majority of the most expensive hotels at Disney World to shame, and that takes some doing. Also, I’m still struggling to understand how several of these over-the-top hotels in Vegas can coexist just a few blocks from each other and still make tons of money. The shows. On Saturday night, we walked to the Bellagio to see the Cirque du Soleil water-themed show “O” (a pun on eau, the French word for water). The show was visually stunning and contained some fine acrobatics, but it also seemed abstract and a little confusing. I’m not sure if I understood everything that was going on, or if I was supposed to, for that matter. Considering that my ticket for “O” cost more than my flight home, I’ll probably wait a while before I see another Cirque du Soleil show. By contrast, I thoroughly enjoyed the Penn & Teller show that we attended at the Rio the following evening. They performed some impressive magic tricks, but their act was hilariously irreverent, too — Penn poked fun at nearly every show in Vegas, including his own. We even managed to get a group picture with Teller after the show! The food. We ate very well in Vegas, but dining wasn’t as inexpensive as you might have heard. If you’re looking for genuinely good buffets, you’re going to pay much more than $10 for them, but they’re still a relatively good deal. We all enjoyed the Spice Market Buffet for one dinner and one breakfast at the Aladdin, but my favorite meal by far was the Village Seafood Buffet at the Rio. The all-you-can-eat dinner of crab legs, lobster, and peel-and-eat shrimp was delicious, and the dessert selection was too good to pass up. Other sights and sounds. We spent our first evening at Ghost Bar at the Palms and the following night at House of Blues at Mandalay Bay. During a brief visit to downtown Las Vegas, we happened to catch an impressive light show on Fremont Street. And as we toured the hotels along the Strip, I certainly enjoyed the chance to catch a brief ride on the Las Vegas Monorail, although its route wasn’t nearly as convenient as I would have expected. One additional benefit of the trip was a chance to meet up with Eric, an old friend from my summer at Disney who now lives in Vegas. I hadn’t seen him in person for about eight years, so it was great to catch up on old times, and he was a very gracious host to me and my friends. Thanks, Eric! To a first-time visitor like me, Las Vegas is pretty surreal — the scale of everything is enormous, and the atmosphere feels like a different planet. And after dropping a surprising amount of dough on meals and cocktails over the course of a few days in Vegas, I was fairly certain that my American Express card would catch on fire before we left. But I’m happy to report that no one’s gambling losses required them to return home wearing a barrel, and that none of our behavior resulted in a spontaneous marriage license or a criminal record. Imagine that your wedding, a lavish affair with 600 guests (! ), is just a few days away. Your fianceé mysteriously disappears, a massive search is launched, and you are subjected to a lie detector test regarding her whereabouts. Against all conceivable odds, she turns up alive in New Mexico, fabricates a story about being kidnapped, and then finally comes clean — she simply got cold feet about getting married to you. Sounds like an implausible plot from a made-for-TV movie, but it really happened to you, and the entire country knows about it. How would you react? Dude, I think this is slightly more complicated than a misunderstanding. Sure, it’s great news that Jennifer Wilbanks is alive — but according to my scorecard, she’s managed to deceive you, your family and friends, her family and friends, and the police in the space of a few days. I’m no relationship expert, but that’s not exactly a firm foundation for a marriage. By the way, if this nationally televised saga involved a man who had skipped town just days before his wedding, I seriously doubt that the jilted bride would ever take her reluctant fiancé back, and I wouldn’t blame her. John, your action plan is simple: grow a spine, turn around, and run.